Aneesoft Video Converter Suite for Mac is all-in-one video converter package including two converter tools: Video Converter Pro for Mac and DVD Ripper Pro for Mac, to convert DVD movies and videos to any video and audio formats for portable devices. With Aneesoft Video Converter Suite for Mac, you can easily convert all your DVD movies and videos for iPad, iPhone, iPod, Apple TV, PSP, PS3 and Mobile Phones etc. Convert all videos and DVD movies to any video and audio formats on Mac. ...... on portable devices such as iPad, iPhone4, iPod touch, Apple TV, PSP, PS3, SmartPhones and more. Moreover, you're able to edit videos with its built-in editing tools: crop, trim, add watermarks and special effects. * Convert DVDs to any SD and HD video formats on Mac. 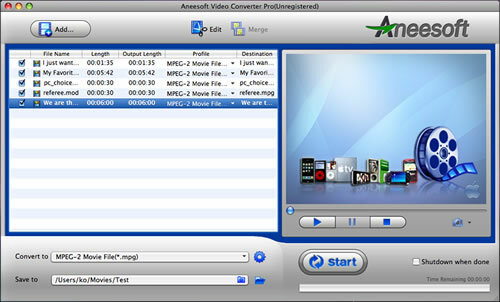 Aneesoft Video Converter Suite for Mac can convert between any video formats and even convert HD videos to many other video formats on Mac for either uploading to YouTube or editing in Windows Movie Maker, such as convert AVCHD (*.mts, *.m2ts) to AVI, WMV, FLV etc. as well as down-convert video from High-Definition to Standard-Definition for watching. * Convert DVDs and videos for many portable devices. Qweas is providing links to Video Converter Suite for Mac 2.9.8 as a courtesy, and makes no representations regarding Video Converter Suite for Mac or any other applications or any information related thereto. Any questions, complaints or claims regarding this application Video Converter Suite for Mac 2.9.8 must be directed to the appropriate software vendor. You may click the publisher link of Video Converter Suite for Mac on the top of this page to get more details about the vendor.